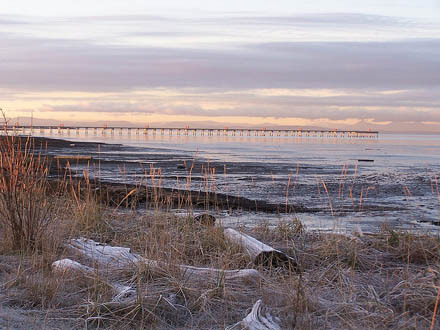 Iona Beach Regional Park is north and west of Vancouver International Airport. It is a location with excellent viewing at the border between land and sea, where you can observe a surprising mix of wilderness and commercial air and river traffic, then walk towards the setting sun to stand under and endless sky along a 4km jetty. Iona Beach is managed by Metro Vancouver Parks, please visit the website for more information. Excellent viewing at the border between land and sea, observe a surprising mix of wilderness and commercial air and river traffic, then walk towards the setting sun to stand under and endless sky along a 4km jetty.